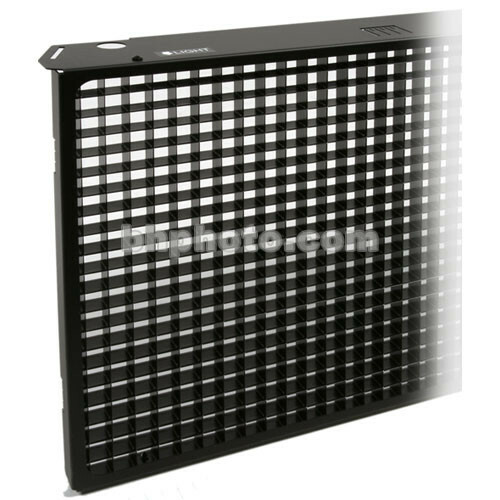 This is a black, aluminum Narrow-Spread Intensifier Eggcrate for the ARRI Studio Cool 2+2 fluorescent fixture. It limits the normal spread of 120° of each section to about 30° and increases the light output approximately 1 f-stop. Eggcrates are essential accessories for any lighting system. An eggcrate alters the shape and intensity of the light output from your light fixture. Consider an eggcrate as a painter would a brush or a sculptor would a knife or chisel. An eggcrate is a rigid or semi-rigid plastic or metal grid that narrows the spread of light. The spread of light will be determined by the density of the honeycomb mesh and the distance of the subject from the light.